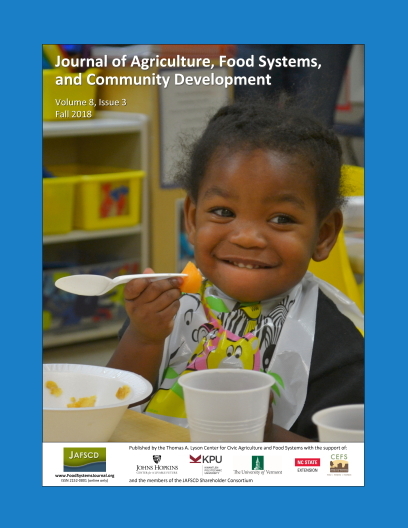 Farm to school (F2S) programs aim to educate people about food and farming, to increase the availability of fresh, nutritious foods, and to improve health outcomes among children. Nationally, all states have school districts that self-identify as farm-to-school program participants. National and regional food procurement systems account for the majority of food purchased by National School Lunch Program participants, but school foodservice authorities (SFA) who purchase food from farmers often do so in the context of strengthening their farm-to-school program (U.S. Department of Agriculture [USDA], n.d.-b). A greater number of local supply chain participants benefit when food is sourced in state (locally) rather than out-of-state because more money ends up in the pockets of local producers and distribu­tors. Local fruit and vegetable producers and SFAs interested in developing business partnerships for local procurement would benefit from recommen­dations on menu-appropriate fresh market prod­ucts, volume, and purchase prices. However, detailed data sets from SFAs are uncommon, limiting opportunities to advance procurement efforts. The objective for this project was to begin developing local procurement recommendations for other Florida school districts based on the purchasing history and experiences of the Sarasota County School District (SCSD). In 2014, Sarasota County, Florida, received a USDA F2S implementation grant, affording it the opportunity to develop its local procurement efforts. One deliverable from that project was a robust data set of school food purchases over a two-year period. With permission SCSD, we analyzed seasonal purchase variations and market prices of local and out-of-state fresh fruits, vege­tables, and egg purchases for 38 public schools in the SCSD. In this paper, we present an approach to estimate the potential of local procurement viability in the context of an emerging districtwide F2S program and recommend system changes based on the success of procurement efforts in SCSD and surrounding school districts in Southwest Florida.